This kinetoscope short was probably seen as a major breakthrough at Edison Studios. Here, at last, was something that truly demonstrated the system’s ability to capture and reproduce motion. 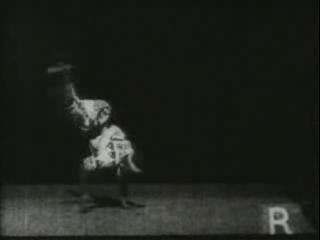 A man leaps and dances wildly, performing his act at the Black Maria studio, and each move is clearly visible. I have run across several modern websites which refer to his performance as “early breakdancing,” but I recognize it as part of the long history of tumblers, or acrobats, who performed their feats before courts and in marketplaces throughout the world. At the beginning of the film, Hadj tosses away a knife, having evidently just finished a juggling act, which may have also been filmed, but so far as I know no one ever saw it. Once again, we see the appeal of the exotic “other” in terms of the “orient;” Hadj is identified as an “Arab juggler,” and to the Victorian audience his gyrations represent a kind of escape from repressive stiffness, but also something intriguingly dangerous and “dark,” which may explain why the knife was left in (or just the fact that no one had invented editing yet). You can watch it for free: here or here.